A timeline of activity relating to the deprecation of Google Maps Engine and the subsequent interest from Esri and CartoDB in particular. Thanksgiving is just around the corner and with it comes some HUGE traffic and travel headaches. Using historical data and trends, Google has shared some details of the worst travel times and days. 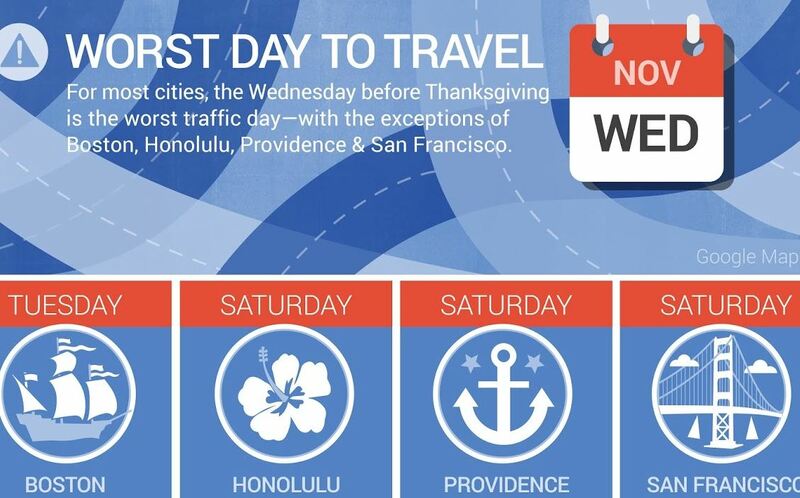 According to the research Wednesday is the worst Thanksgiving traffic day for most cities, with Saturday the worst day to return. Something new from the Google Maps crew today – Google my Maps. By the end of this year, all maps created in classic Google Maps will automatically upgrade to the new My Maps, but to get started right away, open up the new My Maps and “Upgrade now,” then check out the tour—found in the settings menu—for tips on creating your own custom content. Google has this week announced that Google Coordinate will now be included with every Maps Engine Pro subscription ($5/user/month). Recall, Google Maps Coordinate, is the mobile and web app that lets teams assign jobs and share their locations with each other in real-time. Now Maps Coordinate will be much more accessible to businesses and individuals through better pricing, easier sign up and support for any Google account (you no longer have to be just an Google Apps customer). Last fall Google introduced Maps Engine Pro as a new tool to give businesses and individual users an easy-to-use tool for collaborative map creation. With the combination of Maps Engine Pro and Coordinate, we’re excited to upgrade our customers’ ability to communicate, organize and make decisions with location-based insights. Yes indeed, I take notice when I see maps of things I really enjoy, like beer and coffee! Enter these maps showing “walkable regions” for independent coffee shops in major Metropolitan areas like Brooklyn, Portland, and Seattle. Some Google maps fun on the heels of the announcement by Colorado Governor John Hickenlooper that the Colorado Rockies mountains known as the 14ers (think elevation above 14,000 ft) have been temporarily, officially renamed to honor the super Bowl bound Denver Broncos. Feb 2 has been officially proclaimed Denver Broncos Mania Day in Colorado! Here’s an interesting resource, particularly this time of year as we enter the height of flu activity – Google flu trends. The resource shares flu maps and data based on aggregate Google search data (estimations are provided). The site has a simple layout with users being presented with a Global map of trends around the world. simply click on a country of interest to view more detailed data (estimates) – currently you’ll see that North America has a ranking of “High” – Western Canada and the western US currently have the highest rate of affliction. Remember PegMan? You know, the cool little guy that helps you navigate around Google maps? Well, google has brought back pegman (did you notice he was gone?) . Recall, he’s the little yellow guy that would drag onto a street map in order to gain access to Google Street View imagery. In addition to the return of pegman Google maps is also offering a host of new features like photo spheres (think 360 degree imagery) , Earth Tours (stunning 3D imagery of buildings), and more. See more about the latest updates in this blog post on slashgear or see the google maps blog for more . See also here for details of the new Google Maps for desktop. Oh, and check out ALL the different Pegman icons available from Google. WOW!